Tatiana Cigars are one of the leading flavored cigars in the world. Crafted from high quality Dominican tobacco, an Indonesian wrapper and finished with a Dominican wrapper. Every cigar is expertly finished with premium quality flavors. The end result is a smooth cigar which will delight your senses and fill the room with a wonderful aroma. This Groovy Blue blend of acacia flower power and seasoned cognac liqueur will wrap your senses in a delicious trance. Very thin. Smaller than I imagined. Tasted and smelled good though. 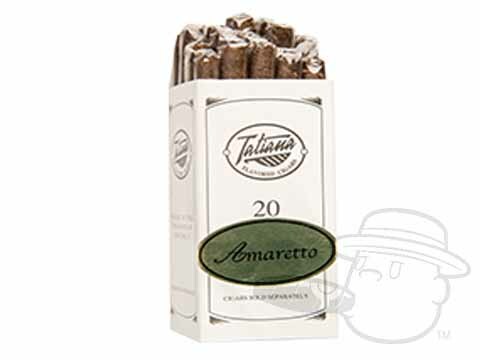 Tatiana Miniature Amaretto is rated 3.1 out of 5 based on 2 customer ratings.